The customer is the core of your business. This makes CRM, your catalyst for business success. It's simple to use interface backed by powerful algorithms makes it easier to run your business and develop active engagement with your customers. 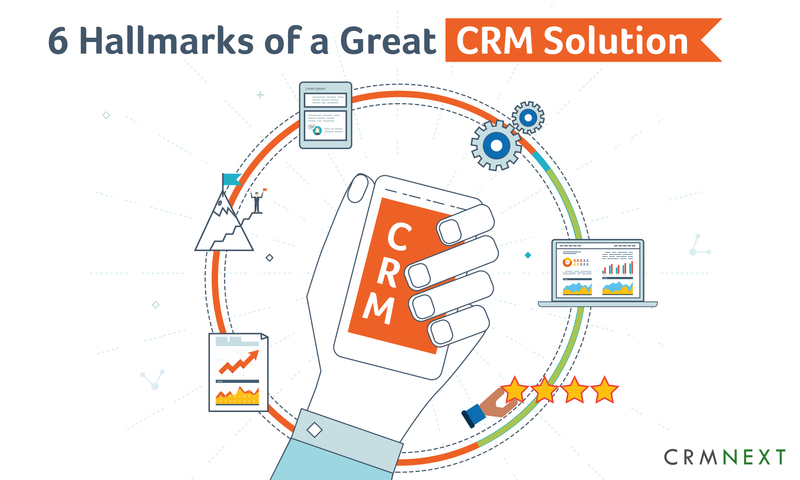 Here are the six hallmarks of an effective CRM software, for your business. Your CRM should have the ability to help your workforce 'see' every customer detail and actions required in a single instance. Without window hopping. CRM will capture all available information about the customers, from all sources including branches, call centers, emails, SMS, web interactions etc. in order to offer the best personalized service possible. The 360° view approach will create a single destination for all customer information eliminating the need to hop between multiple systems. The success of any business does not depend on how advanced a technology is at place. Rather it depends on how that technology acts as an enabler to the workforce to be productive at the highest levels. Right from implementation, the CRM should have a simple interface, despite the complexities involved, that allows business operations with minimum hassle. The complexity of the CRM software affects user experience and might lead to loss in efficiency, even before they adapt to the system. No matter the type of your initial systems, the CRM platform which you chose should be able to retrospectively integrate with your core IT infrastructure. The tools and features should actually optimize the operations, rather than create a new investment headaches for the firm. The database should always be accessible with the correct information, which reduces time wastage especially when doing data analysis. Go for a CRM that has shape-shifting frame based on code-less architecture. Now that you have invested on this software, it should be actively beneficial to your business target, the customers. Your CRM solution should create a customer service platform that proactively addresses all the issues pertaining to customers. It should motivate your support staff towards a professional service. Faster resolutions with defined metrics and SLAs will go a long way in delivering delightful customer experience. Businesses survive under evaluations in terms of success and failure. Based on this analysis, the firms strategize. Monitoring tools in CRM software records customers and employees activities that relate to the business. With the help of these historic data, you can make digital predictions as to market trends, demand spikes, sentiments etc, helping to shape a better tomorrow for your business. For any business owner, the aim is to grow in capacity and scale. What good is a CRM if upgrade costs get in your way? Since the CRM features are important on a long-term basis, the software you invest in should expand as you expand. But without comprising efficiency. Do not consider CRM investment with a short term prism. A great CRM leads to greater business opportunities through delightful customer engagement. Factor in the above six hallmarks while choosing one.